Regular readers of my blog will by now be familiar with my frequent references to the plight of US bands and their struggles to find an audience for their live shows. The 1000-odd people who, only two weeks ago, filled a state-of-the-art venue such as the Zoellner Arts Center for the final edition of NEARfest are very much the exception in a country where non-mainstream bands and artists (especially of the progressive rock persuasion) see their efforts to perform live increasingly frustrated by their potential audience’s apathy. When playing before 50 people is already considered a successful outcome, you know that there is a problem – which may soon force an increasing number of artists to turn their efforts to studio-only projects, no matter how much they love being on stage. For this reason – even if, generally speaking, any band tagged as “neo-prog” would not exactly set my musical pulse racing – my husband and I decided to attend one of Baltimore-based quintet Ilúvatar’s rare live performances after a hiatus that kept them away from the scenes for over a decade. In spite of the suffocating blanket of 100-degree heat (around 40º C for non-Americans) and the threat of thunderstorms later in the evening, we headed towards the ever-reliable Jammin’ Java, and found that a few of our fellow attendees had driven considerable distances for the occasion. Considering the circumstances (including the rather awkward 7 p.m. scheduling), the 50 people or so who attended the DC-SOAR-sponsored gig at the dimly-lit, comfortably air-conditioned venue may be seen as a reasonably successful turnout. Named after the supreme being (“father of all”) in JRR Tolkien’s Middle-Earth legendarium, and with beginnings that can be traced back to 1983, Ilúvatar are nowhere as pretentious as their handle might lead one to believe, and definitely not about the dreaded “pixies and unicorns” all too often associated with prog. In the Nineties, they enjoyed a moderate amount of success as one of the leading US prog bands, which landed them a number of high-profile appearances (such as ProgDay 1996, Baja Prog 1998 and NEARfest 2000) before they went on hiatus. Over the years Ilúvatar have built a loyal following in the Baltimore/Washington metro area, and are clearly one of those outfits for whom the studio will never be enough. Due to my limited affinity with neo-prog, I was not familiar with Ilúvatar’s output, but – in spite of the ready availability of music samples in the age of the Internet – I had decided to go in cold to avoid any bias, having learned that many acts are best experienced in a live setting. The almost two-hour set left me positively surprised, unlike some much-touted names whose shows I have witnessed in the past few years. With four-fifths of the line-up featured on their last album to date, 1999’s A Story Two Days Wide, on board (original vocalist Glenn McLaughlin left in 2011, and was replaced by Jeff Sirody earlier this year), the members all looked quite personable (it was hard to believe that they have been around for 25 years! ), and genuinely happy to be back on stage. Most importantly, though, their performance was focused on delivering tightly composed songs rather than showing off their chops. As seasoned performers, the band members handled the rather cramped stage with aplomb, eliciting the enthusiasm of their loyal fans. As a whole, the music was deceptively straightforward, declining to punch the listener in the face with its complexity. Solo spots were kept to a bare minimum, lending cohesiveness to the overall sound. Jim Rezek (who was the lead keyboard tech at NEARfest) chiefly employed his impressive bank of keyboards to add texture and melody to the sound, effectively supported by Dennis Mullin’s fluid, often fiery guitar; while Dean Morekas powerful bass lines and Chris Mack’s energetic drumming provided a solid backbone with a bit of a heavy edge. My only gripe was the occasional whistling tone of the synthesizers, which is one of the trademarks of the neo-prog subgenre – though it was never overdone. New vocalist Jeff Sirody brought to bear his extensive experience as a frontman in a number of local classic rock and glam metal bands to inject a stronger rock vibe into the band’s sound, and also dispel any criticism about their resemblance to Genesis. His strong, confident tenor managed to be heard in spite of the rather loud volume, and, though long-time Ilúvatar followers may have noticed the difference in style and delivery when Sirody tackled the older material, they were clearly happy with the results. All in all, even if I generally prefer edgier, more challenging music, I found the band’s performance very enjoyable. 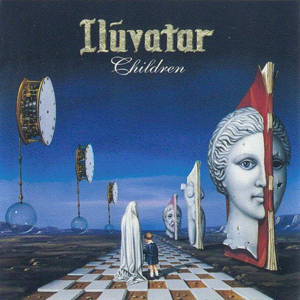 If US prog fans did not cultivate a stubborn “the grass is greener” attitude to the detriment of homegrown acts, Ilúvatar would have been a much better fit for some of the festivals I have recently attended than some bigger-name foreign bands. The fact that Saturday’s gig was only their second in our area – a mere 30 miles south of their home town of Baltimore – bears witness to the sad fact that US-based bands are still children of a lesser God in the eyes of their prospective audiences. The growing divide within the prog scene is not helping either, with people refusing to try a band or artist from the opposite camp even when the ticket to a gig amounts to a whopping $ 10. Ironically, while modern technology has made it possible for anyone to record and release an album – and consequently brought about the saturation of an already niche market – lack of support is in danger of killing the live scene for good. However, no matter how great an album may be, nothing beats live music, especially when accompanied by the right combination of enthusiasm and skill. Progressive rock fans should support live music whenever and wherever they can – do not let the scene die out, or retreat within the four walls of a studio. One of the projects by talented and prolific Ukrainian musician Antony Kalugin (also involved with Karfagen and Hoggwash), Sunchild released their debut album, The Gnomon, in 2008, followed by The Invisible Line in 2009. The Wrap, the band’s third album, was recorded over a two-year period, and released in September 2010. An accomplished artists in spite of his young age, Kalugin has picked a group of gifted Ukrainian musicians for his projects, including string and woodwind players that give his bands’ musical output a well-rounded symphonic dimension. 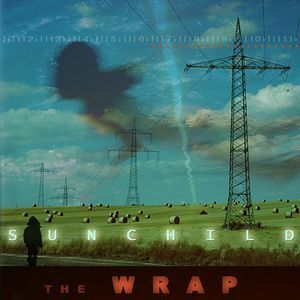 Like a number of other bands from the Russian Federation, Sunchild’s approach to progressive rock is more traditional than innovative, though carried through with panache and impressive technical skill. While the band’s sound is not as openly influenced by classical music as the likes of Little Tragedies, Kalugin’s use of keyboards favouring piano and synthesizers rather than organ, quite a few diverse influences are detectable in Sunchild’s music other than the expected symphonic/Neo-prog strain. Alongside the intense melodic content, enhanced by pleasing vocal harmonies and lovely piano and flute passages, a distinct progressive metal feel surfaces in some of the compositions, which is in line with the trend followed by many contemporary bands that might be gathered under the Neo umbrella. Running at slightly below 60 minutes, The Wrap is dominated by the almost 40-minute epic “Under the Wrap”, which is strategically placed in the middle of the album (a good move, in my view). As I have pointed out on several occasions, I believe that it is extremely difficult for any given band or artist to sustain a composition of such length when it is conceived as a single block, and “Under the Wrap” is no exception. In spite of the undeniable quality of the music, the epic is more of a collection of disparate passages following one another without a common thread than an organic whole, which would have probably benefited from being presented in separate sections. As things are, the composition comes across as quite patchy, its first half starting out in subdued fashion, with subtle references to the great Russian composers of the Romantic era (reinforced by the presence of a bassoon and a string section), and then heading in a strongly metal-flavoured direction suggestive of Dream Theater circa Images and Words. The second half, instead, is strongly reminiscent of Genesis, with a couple of vocal passages in which Kalugin sounds very much like Peter Gabriel, a definitely classical-sounding, string-led section, and then a beautifully melodic guitar solo fading out at the end. Though the musicianship is consistently top notch, there are simply too many ideas left somehow underdeveloped, and not enough cohesion. The remaining five tracks on the album are noticeably shorter the epic, and certainly much more successful in sheer compositional terms. Three of them feature vocals, and are generally mid-paced, melodic pieces with lush keyboard and guitar textures and excellent vocal parts. Opener “Day of Destiny” borders on AOR, with a very catchy chorus and flawless instrumental interplay; while closing track “The Wrap (Outro)” briefly reprises the opener’s main theme, with a brief metal-tinged section leading to an atmospheric, string-led conclusion. On the other hand, “An Angel”, followed by the short, soothing acoustic interlude “Illusionist”, as the title implies is a lovely, rarefied ballad featuring a gorgeous guitar solo backed by piano and percussion. The other instrumental track, “The Wrap (Intro)”, seems to reproduce the structure of the epic, though in a more cohesive way, blending prog-metal suggestions with pastoral moments in the vein of vintage Genesis or Camel. As the previous paragraphs illustrate quite clearly, The Wrap is quite likely to appeal to fans of classic symphonic and Neo-prog, even if the occasional prog metal overtones may put off some of the more traditionally-oriented listeners. In any case, even if decidedly retro in tone, it is a finely-crafted album brimming with enjoyable melodies, and executed with undisputable skill and professionalism. The very thorough booklet, with its stylish artwork and photography, is also deserving of a mention. In spite of the somewhat patchy nature of the epic, the album would be a worthy addition to the music collection of any melodic prog lover. As my long-time readers probably know, I have never been a keen follower of either neo-prog or AOR. In the Eighties – that supposed wasteland for good music – I mostly listened to heavy metal or new wave, and I never went much further than Fish-era Marillion in my exploration of the neo-prog scene. In recent years, thanks to my activity as a reviewer for several progressive rock websites and, I have got acquainted with a lot of diverse, challenging music, which has shaped my tastes in a direction that is often quite the opposite of radio-friendliness. 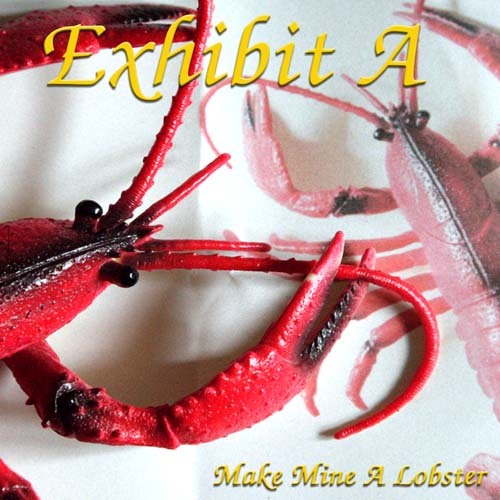 Anyway, whatever my personal tastes, it is essential for a reviewer to keep an open mind and be able to step out of his or her comfort zone – which can lead to pleasant surprises, such as Exhibit A’s third album, the quaintly-titled Make Mine a Lobster. Based in the county of Essex in southern England, Exhibit A were formed in 1986 after the demise of another band called Mithra. They released two albums in the early Nineties, then went into a lengthy hiatus that lasted until 2007, when the five members of the band got back together to discuss recording some new material. In the second half of 2010, Make Mine a Lobster was finally released – sixteen years after the band’s second album – attracting the attention of fans of the more melodic, listener-friendly variety of progressive rock. Unlike so many modern outfits that do so while blithely ripping off other bands or artists, the members of Exhibit A do not claim to be purveyors of wildly innovative fare. Their album – skilfully composed, arranged and performed – is a tribute to the sheer joy of making music that has nothing to do with a desire to rake in the big bucks. They clearly play the music they like, without caring about whether it is trendy or rather a bit on the dated side. Although some reviewers have compared them to Asia, there is a world of difference between that custom-built supergroup, put together with the clear purpose of scaling the charts, and Exhibit A’s genuine enthusiasm. After reading reviews of Make Mine a Lobster, I was somewhat doubtful about what I was going to find – and was, instead, confronted with a genuinely pleasing listen, something that I might slip into my CD player for pleasure and not just for reviewing purposes. Thankfully, my attitude towards ‘pop music’ (a definition that is, in my opinion, way too broad to be used with any real accuracy) is anything but snobbish and narrow-minded. It takes quite a lot of skill to write a good pop song, and I would take good pop over bad prog any day. Bands like Exhibit A, who are not afraid of labelling themselves ‘prog-pop-rock’, are perfect for those times when I need music to please my ear without challenging it too much – and I do not mean this statement to be in the least patronizing. Weary as I am of the endless posturing and waving around of the word ‘proggy’ as if it was the greatest accolade, I found Exhibit A’s approach to music-making extremely refreshing and honest. In the Eighties, mentioning prog and Duran Duran in the same breath would have been next to anathema, but on their website Exhibit A proudly display quotes referencing the former ‘pin-up’ band. Indeed, their sound is firmly rooted in the Eighties, blending AOR, quality synth-driven pop and progressive suggestions in a classy mixture, admirably complemented by the clear, versatile tenor of lead vocalist Dave Foss. Not surprisingly, Make Mine a Lobster is based on relatively short songs that display a rather traditional verse-chorus-verse structure. However, what sets the album above many comparable efforts is the tightness of both the songwriting and the performances, which does not allow for the presence of weak links. The two longest numbers, “Darker Sun” and “Scenario”, clocking in at almost 7 minutes, offer plenty of unobtrusive but noticeable progressive touches in the instrumental parts, such as excellent guitar-keyboards interplay bolstered by precise drumming, and slower, atmospheric sections. Album opener “Touch the Stars” and “Rush of Blood”, on the other hand, are definitely accessible tracks with some serious airplay potential, offering plenty of sweeping keyboards, soaring vocals and melodic guitar licks. All of the above-mentioned songs, as well as “Carousel”, bear the imprint of Rush circa Hold Your Fire. The slower, more subdued numbers like “First to Last”, with its moody guitar coda, and the piano-infused ballad “Missing Years” (featuring a lovely, almost Gilmourian guitar solo) may bring to mind Asia at their best, or even purveyors of quality Eighties pop like Tears for Fears or Talk Talk. “Wake Up to Reality”, with its subtle tempo changes and remarkable synth-guitar interplay, is somewhat more complex than the rest; while “A Far Cry”, despite the Rush reference in the title, brings again Asia to mind, spiced up by some sharper guitar riffing and enhanced by Dave Foss’s outstanding vocals. Though I would not call it a masterpiece (and masterpieces are rather thin on the ground these days…), Make Mine a Lobster is quite a worthwhile effort, at least for those progressive rock fans who are not averse to the more accessible side of their favourite musical genre. True, the keyboards (especially the synths) may occasionally sound a bit dated, and, if you object to high tenor vocals or 4/4 time signatures, then you should probably give this one a pass.In any case, this is as accomplished an album as those released by bands in the same vein with far higher aspirations, and one that will appeal not just to fans of AOR and the catchier end of the prog spectrum, but also to anyone keeping an open mind as regards musical matters. The rather weirdly-named BunChakeze (a ‘creative’ spelling of the more mundane ‘bunch of keys’) were one of the many bands born in the mid-Eighties who – in spite of the much-touted Neo-Prog breakthrough of those years – found themselves in the wrong place at the wrong time. Formed in 1984 by guitarist Colin Tench, drummer Cliff Deighton and bassist Gary Derrick after the demise of the six-piece Odin of London, like the former they were among the many casualties of the lack of interest in music that did not comply with the stereotypes of that era. All too aware of the indifference of record labels and promoters, BunChakeze voluntarily dropped off the radar and went their separate ways after having recorded an album’s worth of material. Fast forward about 25 years, to 2010, when – thanks to progressive rock’s surprising Renaissance – BunChakeze emerged from oblivion. Taking full advantage of the possibilities of the Internet, they finally released their album, and set about to actively promoting it all over the community of progressive rock fans. To be perfectly honest, when I got my copy of Whose Dream?, after having read a slew of enthusiastic reviews, I was curious to see if it really was the best thing since the proverbial sliced bread, or rather one of the many rather undistinguished releases that seem to be a dime a dozen on the current prog scene. Indeed, not everyone would view BunChakeze’s obvious enthusiasm about their release in a completely positive light, and some would even think, “do we really need yet another album by a long-dead band?”. On the other hand, though occasionally showing its age, Whose Dream? is a pleasant listen, easy to approach in just one listening session (unlike so many modern releases), and featuring some noteworthy guitar work courtesy of Colin Tench. True, it is not the most progressive album on the market, and its catchy nature may prove a turn-off for the more elitist fringe. Moreover, the sound quality is anything but flattering to the material: neither the tinny drum sound nor the dated, whistling synthesizers do the album any favours, and Joey Lugassy’s voice sounds positively strained at times. However, it is definitely no worse than many current releases frequently hailed as near-masterpieces beyond their true merits. A strongly song-oriented album, with no tracks longer than 7 minutes, Whose Dream? shows a distinct lack of sprawling epics –a refreshing change of pace from the often overambitious efforts that seem to be the rule these days. Some of the compositions, in spite of their relative shortness, do have an epic scope of sorts: “Flight of the Phoenix” and “Midnight Skies” (dedicated to the plight of Native Americans) both offer enough tempo changes (though never in an overly complex fashion) and instrumental interest to qualify as mini-epics, The general mood of the album tends to be somewhat melancholy, both musically and lyrically – perhaps reflecting the frustration the band members were experiencing at the time the music was composed. As the band members themselves are ready to admit, the biggest influence on BunChakeze’s sound are Pink Floyd, in their more subdued, hauntingly melodic incarnation rather than the experimental one. The intro to “The Deal” is a dead ringer for “Welcome to the Machine”, and Colin Tench’s clear, smoothly flowing lead guitar pays more than cursory homage to David Gilmour’s hugely influential style. Hints of Kansas (without the grandiosity) surface in “Long Distance Runner”, while “Walk in Paradise” shows touches of Deep Purple-style hard rock (even in Lugassy’s vocal approach) in its first half, suddenly changing into a more melodic pace reminiscent of Genesis and Camel. Two sprightly instrumentals bookend the album, putting Tench’s Spanish-flavoured guitar on display; while the above-mentioned “The Deal” is by far the darkest offering on the album, with its haunting bass line, echoing guitar chords, and almost lush keyboard sounds. 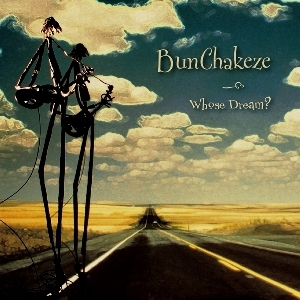 At the time of writing, though the various band members have long since been engaged in other things (not necessarily music-related), it seems that BunChakeze are definitely getting back together, possibly with a view to playing some live shows. Though Whose Dream? is certainly no masterpiece, BunChakeze are a group of talented musicians who deserve respect for their resilience and dedication to their craft. A special mention should go to the very nice CD booklet, with thorough yet funny liner notes, lyrics (which are quite interesting, though occasionally a bit on the naïve side), and vintage photos of the band. Fans of neo-prog and melodic prog in general could do much worse than get hold of Whose Dream?, and help the newly reformed band to fulfil their dream of finally performing on a stage.